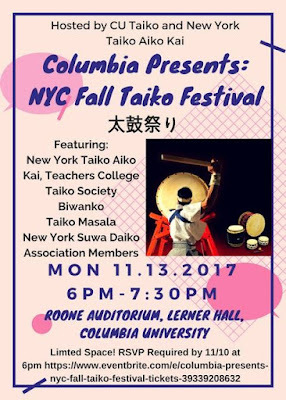 The event, jointly hosted by Columbia Taiko and New York Taiko Aiko Kai, was an exciting one as the program was fairly rich with mostly Osuwa pieces and pieces by Hiro sensei. 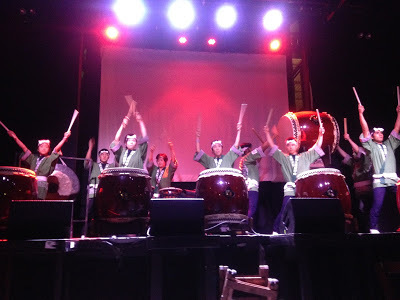 Columbia Taiko did a fantastic job on their taiko pieces. Thanks to Mrs. Okada for these pictures! 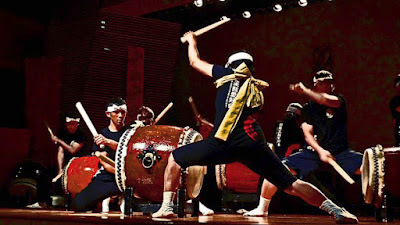 On Sept 9, a bunch of us headed to Westport, CT for their 24th annual Japan Society of Fairfield County Bon Odori. 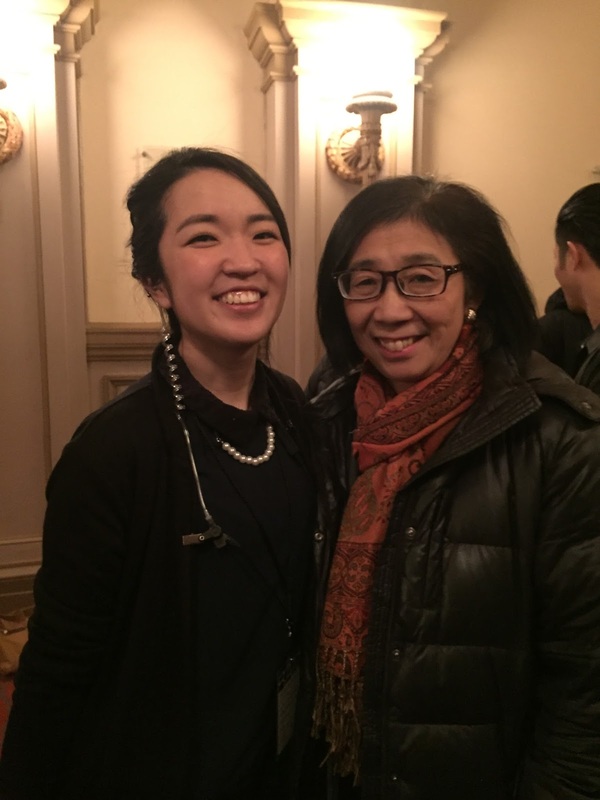 We had a blast performing and afterward, Junko-san graciously hosted us at her home in Westport. For more pictures of the festival, check out this article. 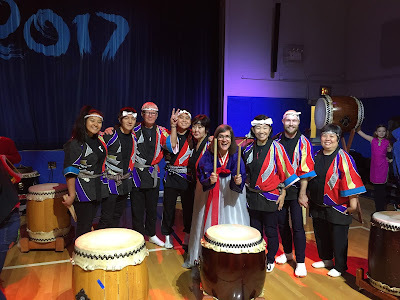 On Aug 12, NYTAK was invited to perform at the opening of a conference for public school parents. 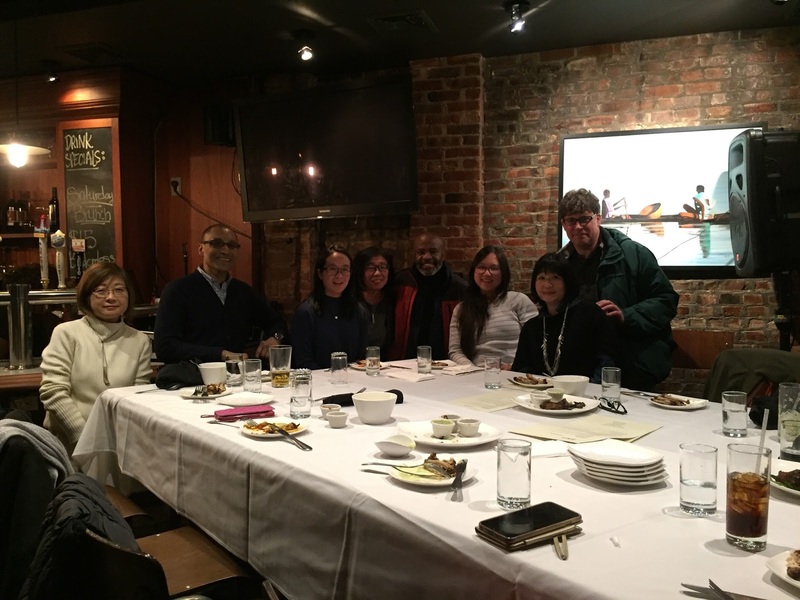 The conference, held by a parent advocacy coalition, focused on culturally relevant education, including the importance of cultural arts in public schools. 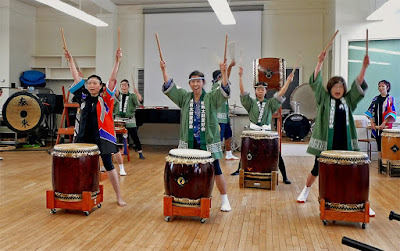 Our short performance comprised of Isamigoma, Mirai, and Kizuna. 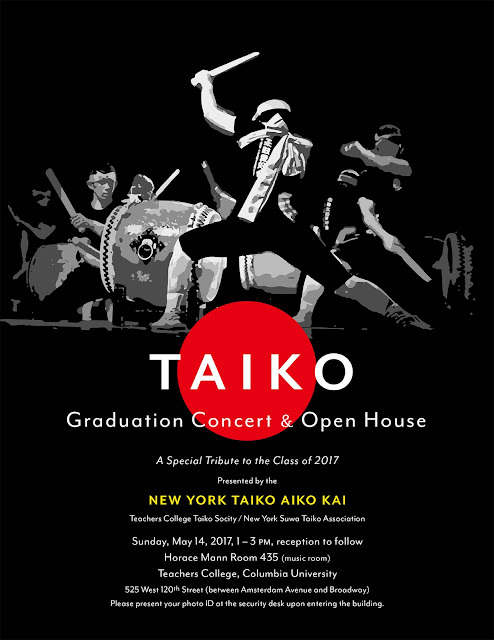 Please join us this Sunday for our annual Graduation Concert & Open House! * Please present your photo ID at the security desk upon entering the building. It was a sunny and glorious day as NYTAK performed in the Sakura Matsuri in Washington, DC as part of the 2017 National Cherry Blossom Festival! Special thanks to Mark Rooney, who supported us by lending his drums! Join Us for the 2017 Sakura Matsuri in Washington, DC! We're excited to announce we will be in Washington DC this Saturday, April 8 performing in the Sakura Matsuri as part of the 2017 National Cherry Blossom Festival! We'll be on from 2:00 p.m. - 2:30 p.m. on the Sakura Stage. See you there! We had a lovely opportunity to see KODO concert once again at BAM on Saturday, March 4th. 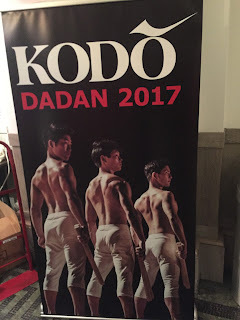 This year's production Dadan (打男）literally means "Drumming Men". Produced by Tamasaburo Bando, a renowned Kabuki actor specializing in female role (Onnagata), Dadan debuted in 2002 and has toured all around the world to great reception. 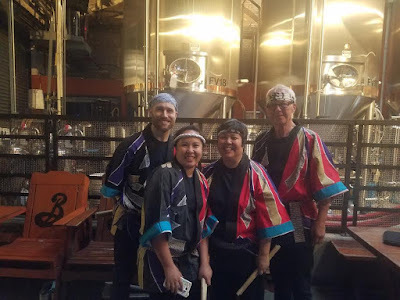 NYTAK was fortunate enough to have a photo opportunity and to talk with the principal drummer Masayuki Sakamoto and Koji Miyagi. 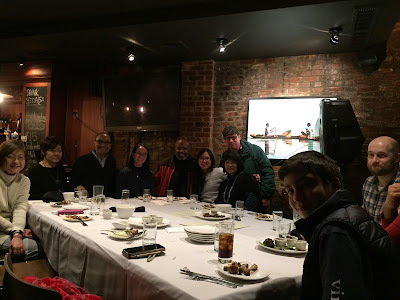 Some of us had met Sakamoto-san a few times in the last decade, whenever KODO came to the New York area to perform. Kyoko and Mayur had last met Koji in Sado when they went to KODO's Earth Celebration when he was still a trainee. 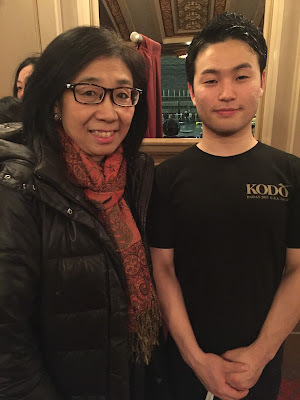 Koji was still a high school student learning taiko when Kyoko-san first met and taught him in New Jersey years ago. He then went on to International Christian University (ICU), where he continued his taiko studies. 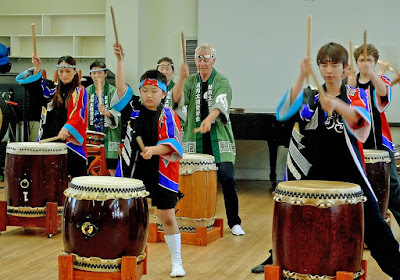 His older sister was also attended the same University and played taiko there. 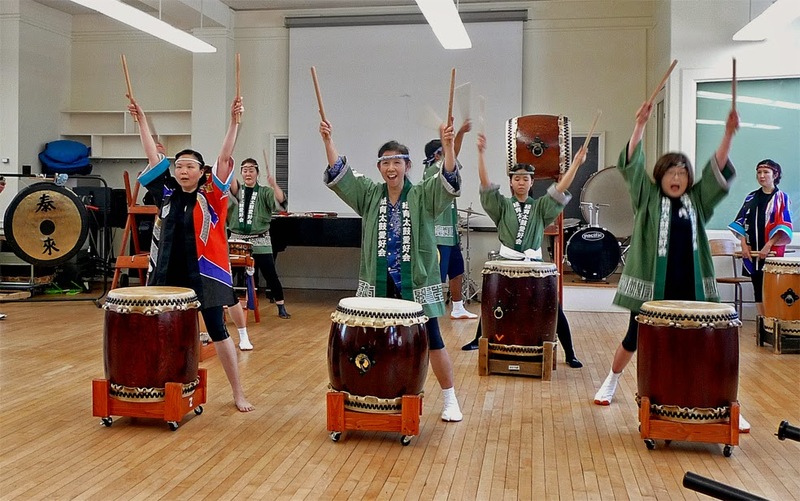 Kyoko is proud to see his commitment to taiko, who continued on to play professionally after graduation. 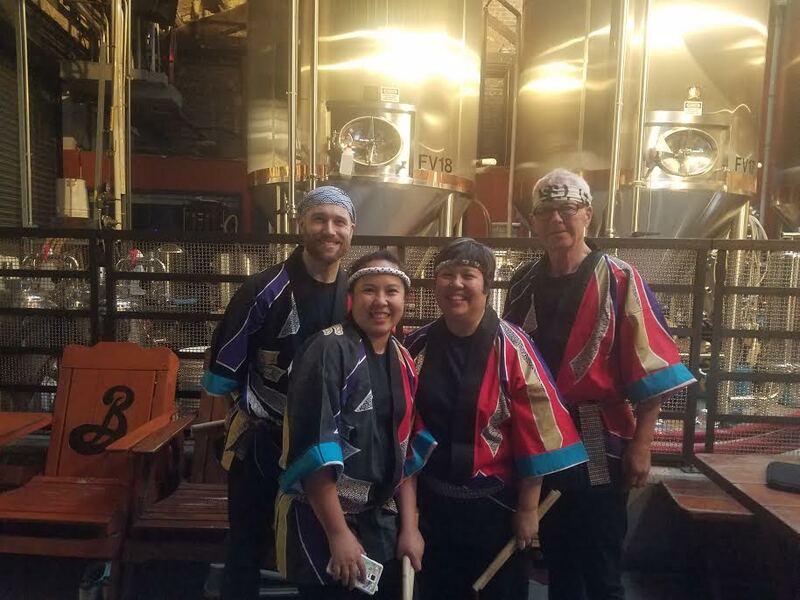 A big thank you to Yui Kawamoto, Company Manager of KODO's world tour and a former UCLA taiko group, for arranging the post concert photo opportunity, and for her continued support of local taiko groups. 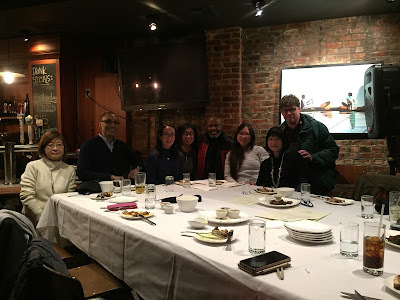 Another thank you goes to the owner of BK9 Restaurant and Bar, where some of us had dinner before the concert. The owner, who is also Kyoko's colleague, came out to greet us and even sent us champagne. Taiko Tides will be the next host of ECTC in 2018, and NYTAK along with Columbia Taiko will be supporting them as one of the local taiko groups.